I had a bunionectomy (right foot) on 5/23/14. The bone was cut and a staple placed to hold the bones together.The MD told my husband and me that I could weight bear after surgery in my surgical boot and to allow my foot to relax in the boot and roll it with each step. My pain has been very minimal. My incision looks great--just some bruising and swelling if I am up for any length of time. I have no signs of infection. 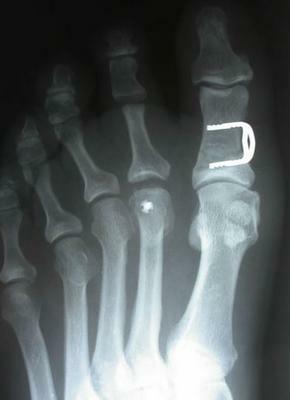 My main concern is with each step I feel non-painful movement in the joint at the base of my great toe. I am in a surgical boot and wear it when walking. When I went back to the MD after surgery, his "nurse" removed my surgical dressing and told me everything looked great. I asked about the joint movement "wiggle" with each step. She told me it was normal. I did not get to see the MD that day. I was told not to wash the incision and to clean with alcohol daily and cover with gauze. Instructed to leave incision open to air when sitting. I called the office on 5/30/14 to ask about the "joint movement" and was told again that it is normal. I am supposed to go back on 6/10/14 to have my sutures removed and plan to discuss my concerns with the MD. I would appreciate your opinion to see if this sensation is normal? I really need to return to work next week if possible and plan to modify my work to allow time to get my foot up. My MD told me prior to the surgery to plan to be out of work for 2 weeks and go back to work in a boot with modified duties. Your sensation of movement in the joint is not a concern that can be addressed just by looking at the foot. All the nurse can ascertain by looking at the foot is to determine if there are any of the cardinal signs of infection such as swelling, redness, drainage from the incision, or gapping of the incision (not closed uniformly). If you had walked into my office with those same complaints I would have taken an x-ray to see what the osteotomy site looks like. This is where the bone was surgically broken and re-set with the staple. there are a good number of osteotomies that can be performed around the great toe joint in order to correct the bunion deformity. If the movement appears to be at the base of the great toe, then I am guessing you may have had an Akin osteotomy which attempts to re-angle the big toe, but I could be wrong. The enclosed x-ray is of an Akin osteotomy, but you may have had an osteotomy on the first metatarsal bone, I am just assuming here. In any event if the staple is not properly holding the bones together, or if it has become dislodged that might account for the sensation you are experiencing. If indeed the osteotomy is not "holding" then that issue is better addressed sooner rather than later. If it keeps moving then it will never heal and you could end up with what is known as a non-union and your bunion surgery experience will be dragged out for months. Most times patients who have an osteotomy around the great toe joint will describe it as a sensation of "clicking" that they feel inside the toe. As you walk, the pressure of stepping on the foot forces movement of one part of the bone and then as you raise that foot, the bone pops back into place. Your symptoms may also be the result of the staple actually moving up and down as you walk. This too is not good because the staple is not intended to move up and down; it is intended to stay in place and allow the two ends of bone to heal. The best person to decide if there is a potential problem is your surgeon, not the nurse. Ultimately the surgeon is responsible for your well being. I know in my office if someone told the patient not to worry about that complaint without consulting with me first, I would be very annoyed. I should also point out that there is the possibility that everything is fine and the feeling that you are experiencing may also be just from the incision of the deep tissues and the re-suturing, but the only way to know is to have an x-ray. Do yourself a favor and call the office and demand to speak with the doctor or at the very least demand that someone in the office actually describe your complaint to the doctor and see if he wants to see you sooner than your next appointment. Thank-you so very much for responding so quickly and in such detail to my question!! I will give my surgeon a call today! !